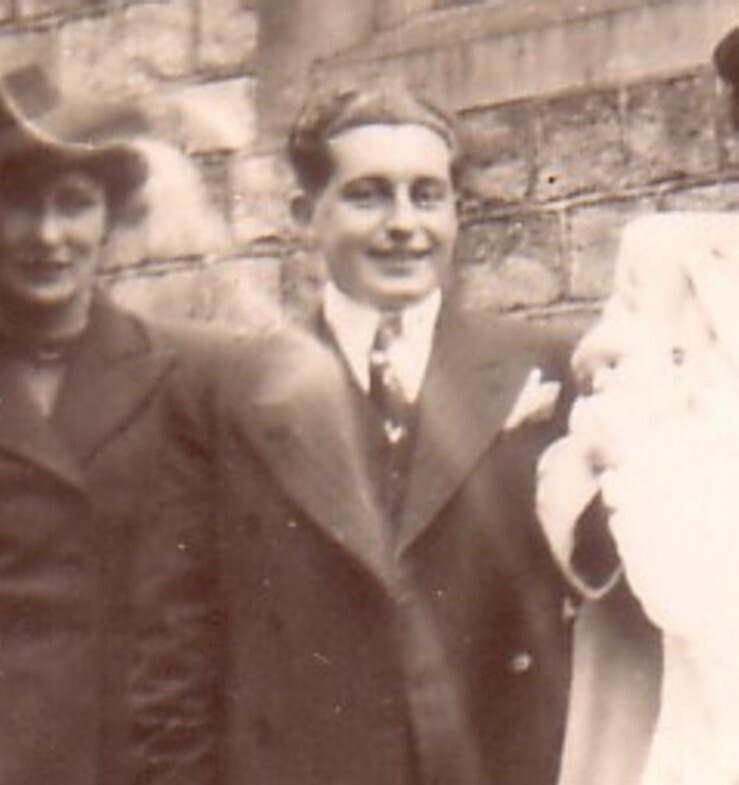 These Christening photos (taken on September 26, 1946) have been in my album ever since I can remember. I had always mused over the strange shapes that appeared on them. It was only when I met a new partner, Kenneth Parsons, that I learned that these images might in fact depict a spiritual occurrence. 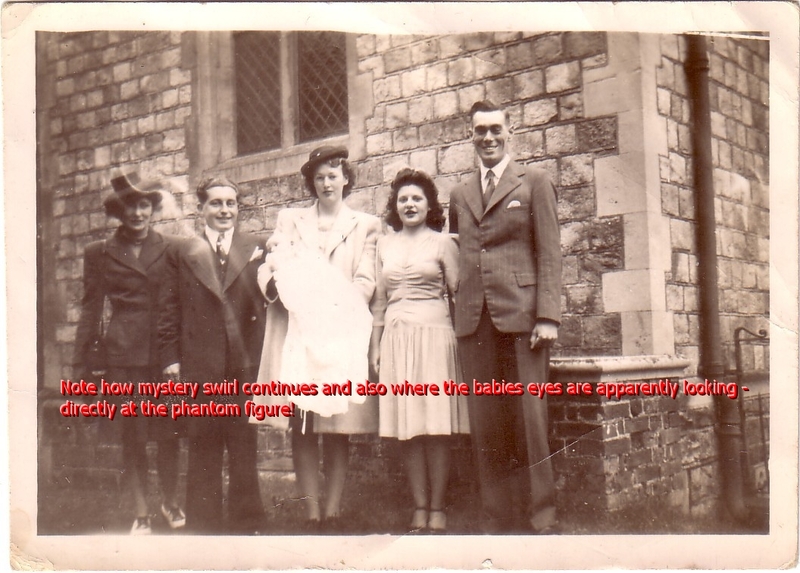 My partner was most impressed by these pictures, which show myself as a baby, my father and my mother, my aunt and uncle, my mother's friend, (Joan Morrish), who were also my God-parents, and he suggested that I should share these images (taken outside St Peter's Parish Church in Farnborough, Hampshire, United Kingdom) with BEAMS readers. 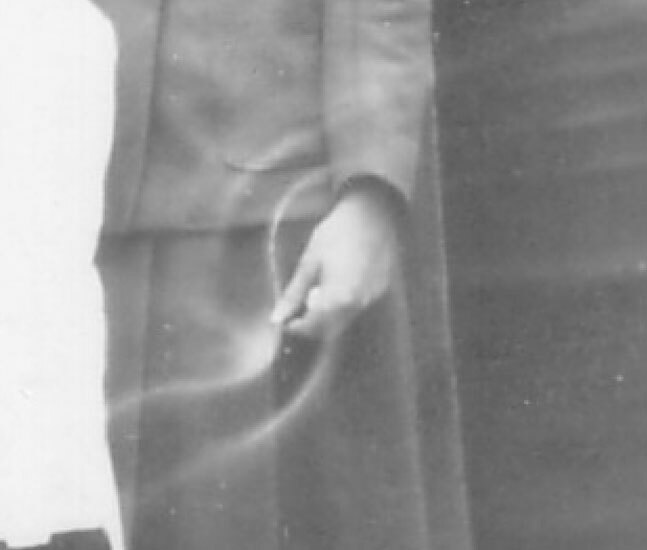 In one picture, swirls of energy seem to be emanating from the hand of my mum's friend Joan... and in the other, the friend has what looks to be an apparition standing next to her and in front of my father: Indeed, it seems as if I am even looking directly at this figure! "James Mitchell writes to us with his photographic analysis of the Hilary Porter photo. or prove this was the explanation, it is nevertheless interesting and offers some insights into matters such as this. 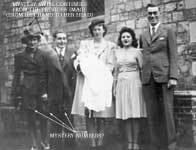 James, I hate to be a “smart Alec”, especially after my somewhat critical post on ufology, but I think all of the artifacts on Hilary Porter's christening photographs can be explained. Although I have to say I'm no expert in photographic analysis, and I could of course be wrong, I do use old cameras myself and am familiar with most of their faults. 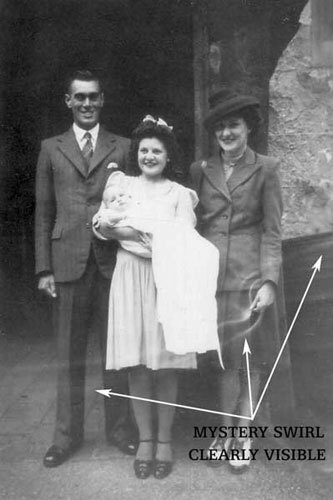 Firstly, the “figure”, I believe this to be an illusion, rather than a photographic artefact. If you look carefully at the window, the apparent “figure” is composed of whole panes of leaded glass, suggesting that these panes reflected the light falling on them (and / or passing through them) differently to the rest due to being of a different colour or condition to the rest. They even may just have been cleaner, or, given the flexibility of leaded windows, angled slightly differently to the “lighter” panes. I have never read such a load of old twaddle in my life, these images are what they are... evidence of the supernatural. 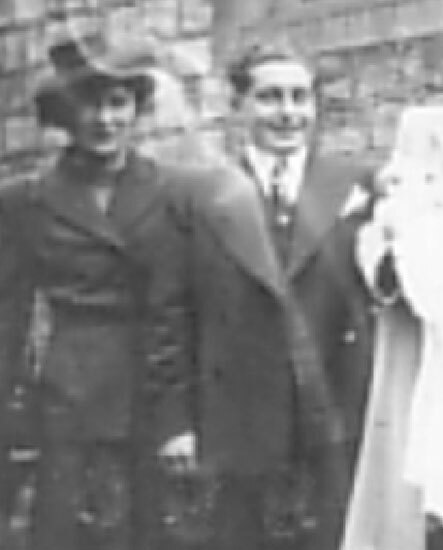 Also before I go, there is something else which may have a bearing on these mystery photos. St. Peter's Church is the earliest remaining building in Farnborough; dating back to the 12th century and featuring it's own Christianized, Sarsen stones. Please click these words to take you to the photos.